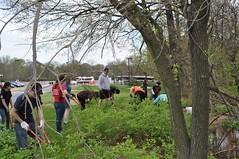 We have many and varied opportunities for people to help us beautify our campus landscape while spending time in the great outdoors. When you come to volunteer, we’ll ask you to really get your hands dirty--weeding, raking, pruning, planting trees, shrubs, and flowers, cleaning up landscapes, mulching, or replenishing footpaths--and you will feel like you have accomplished something special when you are done. 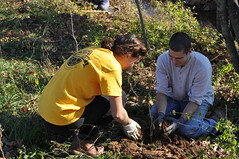 We always come up with fun, active projects that enhance the beauty of campus and engage you with nature and your fellow volunteers. Our volunteers come from a variety of places--service organizations, fraternities and sororities, academic departments, university alumni organizations, and local high schools. No matter what your background, the Arboretum & Botanical Garden wants to benefit from your hard work. We host both large- and small-scale projects and can customize the perfect project for you. 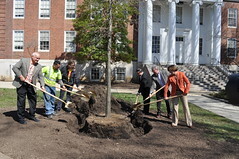 Email arboretum@umd.edu for more information. More information about internships can be found here.